Today, the UK formally notifies the EU that it is invoking Article 50 of the Lisbon treaty, to begin the process of withdrawal. 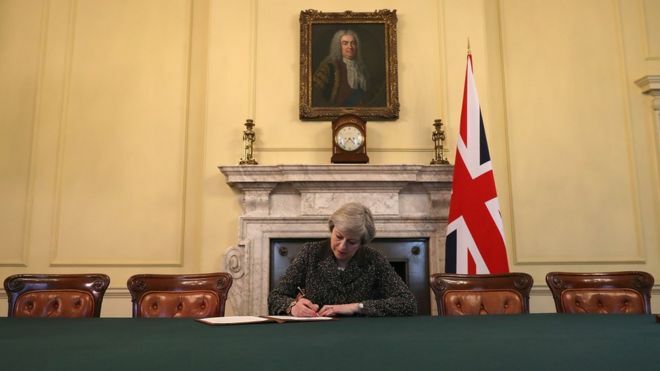 Theresa May signs the letter of notification. Hurrah for freedom. God save the Queen. Enjoy shouting those slogans, because it's about all the benefit we'll get from this sorry exercise. Bloody hell, we're in a mess and no mistake. Parliament had its chance to impose conditions on the government, but through ineptitude and cowardice it has failed to do so. For its part, the government has rejected the option of a Norway-style deal; the UK will leave the single market, which was a favourite project of that well-known Continental socialist Margaret Thatcher. We're going to tear up all of the UK's existing trading relationships, and a delicate web of cooperation on everything from scientific research to the Northern Ireland border. Our new status will be negotiated by Boris Johnson, David Davis and Liam Fox, and I'm not convinced they have one functioning brain between them. After much time and effort we will, at best, end up with something much like what we had before. Yeah, but freedom. Freedom to be pushed around by much larger trading partners like the USA, the rest of the EU, and China. Freedom to repeal the EU directive on beach cleanliness, so we can swim around in sewage. Is this not a thing to celebrate? The hard-Brexit mentality resembles that of a vagrant who refuses to settle down, take responsibility, or get a steady job. He's proud of answering to no one, and being able to walk away from anything he doesn't like. Fine for an individual if that's what he wants, but it's a stupid way to run a modern country. The leading Brexiteers would like nothing better than to transport us back to the Victorian era, but are up against the slight difficulty that it's impossible. We live in a technologically advanced, interdependent world of dizzying complexity, built on foundations of law and international agreement. The UK will continue to take part in the globalised economy; the alternative model is North Korea, which even the Brexiteers don't see as a viable option. In the modern age, there is nothing splendid about isolation. We will have to negotiate a place in the international order hastily and from a position of weakness. A significant faction in the Conservative party doesn't understand that, and doesn't care to; it is they who are holding Theresa May's government to ransom, and driving us towards the hardest possible Brexit. We are all going to end up poorer, so they can indulge their fantasies of empire. It's going to be the work of a generation to recover from the damage they are doing.